Claimed as the world’s most valued sports franchise, The Dallas Cowboys have been a force to be reckoned with in the NFL. When you choose to bet on this team, you will be betting on a team that has easily become a favourite for the oddsmakers and betting fans as well. You can easily bet on the Dallas Cowboys on the internet easily by finding safe and trusted sports betting sites for American punters. We have made that easy for you because we have put together a list the top sportsbooks sites online where you can wager on the Dallas Cowboys. However, before you do so, read our guide on how to bet on this team. 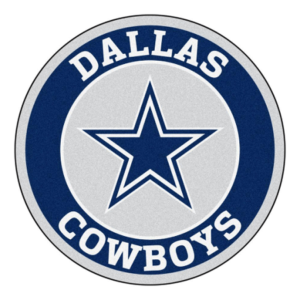 The Dallas Cowboys became part of the NFL in 1960, and their home turf is the AT&T stadium located in Arlington Texas. They form part of the National Football Conference (NFC) East division and are on the top of it. The team has won 21 division titles and 30 playoff berths. They have also reached the Super Bowl eight times and won five times. The different kinds of bets available for NFL games apply when you want to bet on the Dallas Cowboys. The most favourite bet is the point spread where you can bet on the possible points that the team can win by. Other bets include the props bets where you can either make it on the whole team or players in the team. One of the examples of the props bet is betting on the touchdowns. There is also the future bets where you can bet that the Dallas Cowboys will win the Super Bowl or even the NFC East division. Also, be on the lookout for the sportsbooks that offer the best betting lines and odds on the Dallas Cowboys. Currently, they have the +2500 odds to win the 2019 Super Bowl, so you can compare to other teams and see if it will be worth it to bet on them. However, keep in mind that the last time they won the Super Bowl was in 1995. The team seems to be more successful in the division with their recent win being in 2014.